The Editor: Are these links also part of your archive, LL ? Second Amendment Cat: They sure are, I use them to show one reason the Second Amendment is so important. At times, I think a second hand gun should be kept in the bathroom. If I had thumbs and some earplugs I would have me a couple of Peace Makers. Remember to lock those bedroom and bathroom doors. Remember that gun users need training/instructions. What makes flying fun? How about funny airline announcements? Pelosium has a normal half-life of approximately two years, at which time it does not decay, but instead undergoes a transmutation, appearing in a new location but displaying the same properties. In this process, deputy morons, assistant morons, vice morons and assistant vice morons exchange places. Some studies have shown that the critical morass actually increases after each transmutation. 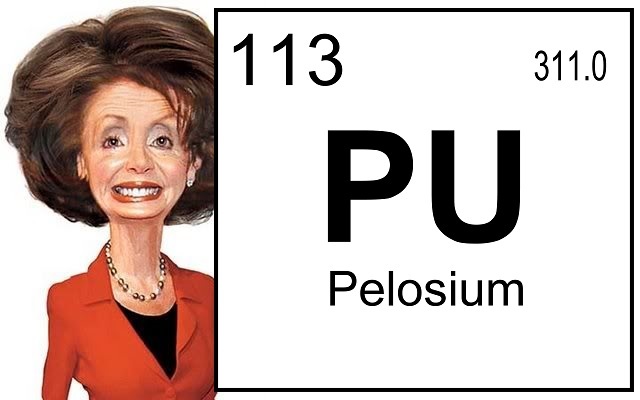 Scientists point out that Pelosium is known to be toxic at any level of concentration and can easily block and even destroy any productive reaction where it is allowed to accumulate. It has also been demonstrated to halt all positive forward movement begun by other elements, especially those elements with opposite polarity. Attempts are currently underway to determine how Pelosium can be neutralized or even just controlled, so as to prevent irreversible damage to elements around it, but thus far, results to date do not appear promising.